This PRO600 Bariatric Pressure Redistribution Mattress 48" width is constructed of multiple layers of high density medical grade foams to relive painful pressure points for patents at high risk of developing bed sores. 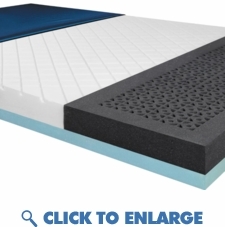 The top layer is covered in a high density soft foam for optimal support and comfort. The bottom layers is constructed of ultra high density high resilient foam which provides unprecedented patient support and stability. The heel section is slightly tapered to relieve pressure and is made of Lura-Quilt™ foam. It is an aerated foam which allows air to continuously pass thru keeping the patient cool and dry. The cover is made of a high quality stretch nylon that is water and fluid proof. Water resistant anti-microbial/bacterial cover is perfect for infection control. The cover is made with an Anti-Contamination Flap that covers the zipper reducing the possibility of fluids contaminating the foam core. This mattress can be used as a replacement to fit on a box spring mattress or a 48" medical bed frame. Ideal for prevention and healing up to a stage 2 bed sore. SIZES AVAILABLE 48" WIDTH X 76" LENGTH X 6" DEPTH 48" WIDTH X 80" LENGTH X 6" DEPTH 48" WIDTH X 84" LENGTH X 6" DEPTH Weight capacity: 1000 lbs. Fire rated 16 CFR part 1632 & 1633. This PRO600 Bariatric Pressure Redistribution Mattress 48" width is constructed of multiple layers of high density medical grade foams to relive painful pressure points for patents at high risk of developing bed sores. The top layer is covered in a high density soft foam for optimal support and comfort. The bottom layers is constructed of ultra high density high resilient foam which provides unprecedented patient support and stability. The heel section is slightly tapered to relieve pressure and is made of Lura-Quilt™ foam. It is an aerated foam which allows air to continuously pass thru keeping the patient cool and dry. The cover is made of a high quality stretch nylon that is water and fluid proof. Water resistant anti-microbial/bacterial cover is perfect for infection control. The cover is made with an Anti-Contamination Flap that covers the zipper reducing the possibility of fluids contaminating the foam core. This mattress can be used as a replacement to fit on a box spring mattress or a 48" medical bed frame. Ideal for prevention and healing up to a stage 2 bed sore. Fire rated 16 CFR part 1632 & 1633. Heel section is made of Lura-Quilt™ foam. It is an aerated foam which allows air to continuously pass thru keeping the patient cool and dry. Water resistant anti-microbial/bacterial cover is perfect for infection control.